We're getting ever-so-close to the release of Ryse: Son of Rome for the Xbox One, an exclusive launch title from Crytek, the makers of Crysis and the CryEngine technology. With the game's launch impending, Crytek has been letting loose new material for the game, and one of the latest bits of promo media is a trailer about the legend of Damocles. There's a vicious sense of purpose to the trailer and a thrilling pace of artistic vengeance on display, all contained within two minutes... and it's better than anything we've seen from Ryse to date. Recently Crytek sent out a story trailer for Marius, the main protagonist of the game, showcasing this guy's by-the-books story that looks about as exciting as watching fungus grow on the shell of a snail, or examining the techniques of old men clipping the hairs out of their ears in a retirement home. Everything about the Marius story trailer was a terrible, predictable, trite exercise in stereotypical corporate cash-in culture. Worse yet is that the story trailer contained some gameplay snippets that were both uninspired and uninteresting. There was nothing there that told gamers it was anything but a QTE-button mashing fest that would SNK fanboys snicker and the FGC shake their head in shame at the pure lack of skill required to “win” at the game. Of course, Crytek has adamantly stated that their game isn't a QTE-fest with ardent resolve. Despite everything else, visual design studio Platige rolled out the only compelling thing about Ryse – a visually enthralling masterpiece that contains heart and oil-painting pastiche that breathes all sorts of life into an otherwise dead-on-arrival new IP. 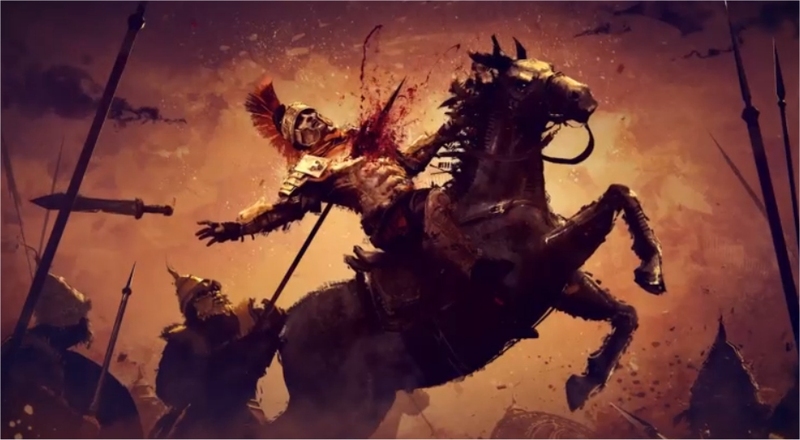 I don't know if it would have done Ryse any favors, however, showcasing a trailer like the Legend of Damocles during E3 where most people would have expected an enticing, artistic retelling of a Roman myth. Instead, we see Platige take Crytek's own SDK and turn out something with more heart and soul in two minutes than all of the previous Ryse footage combined. Heck, is it possible we could get Platige to write and direct Crytek's next title and just have the Crytek crew provide all the technical know-how and support to get the game off the ground? The Damocles trailer easily rivals the intrigue we've come to expect from God of War while establishing an art-style that is absolutely breathtaking. I want to see more of that. Nevertheless, poor Xbox fanboys will be stuck with a greyish brown sword-and-board rendition of Call of Duty without any of the fun parts. If you're into feeding a corporate machine then by all means do so. Hopefully this trailer will drum up enough interest to give Crytek some incentive to think outside the box in their next game... or maybe, just make a game based on Damocles based on what Platige teased us with in the trailer above. Heck, I didn't even know the CryEngine was capable of those kind of filters... well done Platige, well done.